2016 will be an exciting year in the aerospace industry, as GE Aviation and their partner Snecma (SAFRAN) of France, are planning to introduce the first 3D printed parts for aircraft engines in their new CFM LEAP engines. 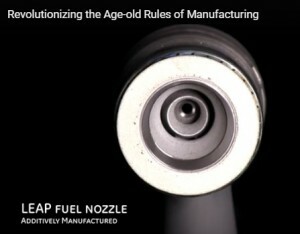 Apparently, the special fuel nozzles in the combustion system are designed to be produced by 3D printing and could not be manufactured by conventional manufacturing processes. The ability to mass produce aircraft parts by 3D printing is expected to revolutionise the aircraft manufacturing industry. Experimentation with new metal materials using laser technology and 3D-printing technology may even lead to the development of interesting new metal combinations that will offer a vast number of new and exciting opportunities, not just for the aerospace industry, but across all engineering and manufacturing processes. GE Global Research introduce a new revolution in aircraft manufacturing using innovative new technology in the video below.